Buy custom leather belts and ready to wear belts, for men and women, handmade in the finest calf, Italian and exquisite exotic leathers. Handmade and custom made to order. 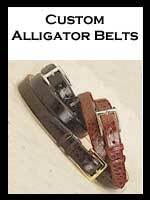 The world's best alligator belts. Custom made to order exotic leather belts handmade in regular and big and tall men sizes. 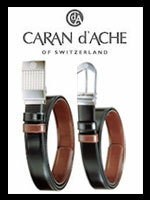 Elegant handcrafted luxury men's leather belts from Italy in fine calfskin. Ready to Ship men's dress belts in alligator, crocodile, lizard, ostrich, and calf leather. 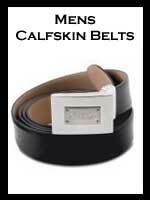 Handmade reversible leather belts in the finest luxury Italian leather with a very durable finish. Pineider leather belts are handmade in the same types of fine exquisite leather used in their Italian leather goods. Handmade luxury fashion belts for women handcrafted in leather and exotic skins. Get luxury leather belts in black, brown, and other colors. You can also buy luxury leather belts in custom sizes or in big men's belts, by special order. When you want a luxury gift for him or her, whether you an buy alligator belt, a crocodile belt, or a ostrich belt, our exotic leather belts are the finest luxury leather belts available. Exotic leather belts are great accessories for women too. 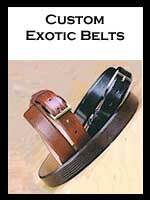 We offer an extensive selection of colors and a wide variety of exotic leathers for your choice of a man's dress belt, men's casual belt, or a fashionable woman's belt. When you buy men's luxury leather belts for real men (lovely ladies too) these exotic leather belts are sure to please. 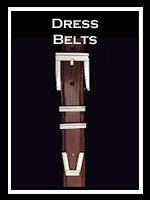 The exclusive expensive luxury leather belt is a Pianki specialty. We offer the world's finest handmade luxury leather belts available. 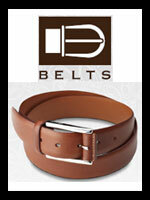 Buy luxury leather belts for executives, fashion sophisticates, or elegant casual wear. 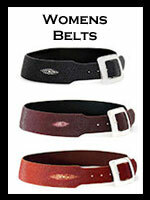 Fulfill any wardrobe need with our wide selection of luxury handmade leather belts.